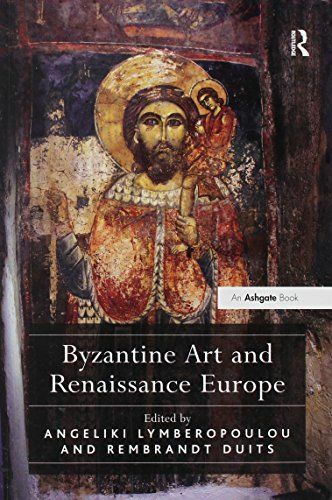 Byzantine Art and Renaissance Europe discusses the cultural and artistic interaction between the Byzantine east and western Europe, from the sack of Constantinople by the Fourth Crusade in 1204 to the flourishing of post-Byzantine artistic workshops on Venetian Crete during the fifteenth and sixteenth centuries and the formation of icon collections in Renaissance Italy. The contributors examine the routes by which artistic interaction may have taken place, and explore the reception of Byzantine art in western Europe, analysing why artists and patrons were interested in ideas from the other side of the cultural and religious divide. In the first chapter, Lyn Rodley outlines the development of Byzantine art in the Palaiologan era and its relations with western culture. Hans Bloemsma then re-assesses the influence of Byzantine art on early Italian painting from the point of view of changing demands regarding religious images in Italy. In the first of two chapters on Venetian Crete, Angeliki Lymberopoulou evaluates the impact of the Venetian presence on the production of fresco decorations in regional Byzantine churches on the island. The next chapter, by Diana Newall, continues the exploration of Cretan art manufactured under the Venetians, shifting the focus to the bi-cultural society of the Cretan capital Candia and the rise of the post-Byzantine icon. Kim Woods then addresses the reception of Byzantine icons in western Europe in the late Middle Ages and their role as devotional objects in the Roman Catholic Church. Finally, Rembrandt Duits examines the status of Byzantine icons as collectors’ items in early Renaissance Italy. The inventories of the Medici family and other collectors reveal an appreciation for icons among Italian patrons, which suggests that received notions of Renaissance tastes may be in need of revision. The book thus offers new perspectives and insights and re-positions late and post-Byzantine art in a broader European cultural context.